Wonthaggi is a rural township between Western Port Bay and Wilsons Promontory, 110 km south-east of Melbourne. According to Bunce's Language of the Aborigines of the Colony of Victoria (1859) Wonthaggi is an Aboriginal word meaning borne or get to bring. Before being named, the area was known as Powlett. Wonthaggi came about as a coal mining town. The South Gippsland region had coal mines at Kilcurda, 12 km north-west of Wonthaggi, and inland at Jumbunna, Korumburra and Outtrim. By the mid-1900s these coal sources were in decline. The Victorian Railways, constantly expanding its network, was reduced to burning wood for locomotive fuel, and there was suspicion of price squeezes by New South Wales coal producers. In 1908 coal seams were discovered at Powlett River plains, varying from six to eight feet thick, although they were fragmented. The next year Wonthaggi coal mining started. There was a ready workforce from Gippsland coal mine towns and declining gold mines at Rutherglen and Walhalla. The workers lived in a tent town. 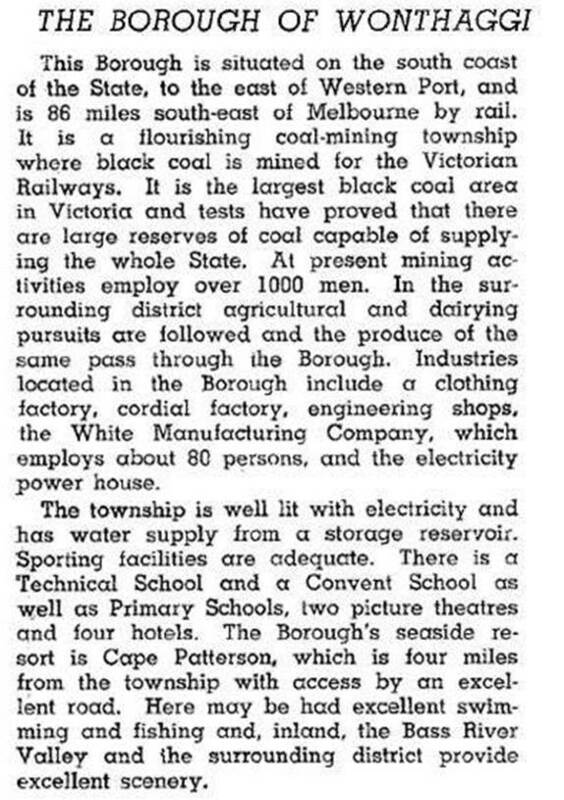 For short time coal was taken to Inverloch for shipment until a railway from Nyora to Wonthaggi opened in late 1909. Wonthaggi was a State coal mine for Victorian Railways locomotives. A school opened in 1910 as families grew. In 1911 the built town started: borough council, Masonic lodge, Methodist and Anglican churches (the latter in a fine building from Walhalla), bowls club, worker’s club and a Catholic school. By 1912 the mine employed 1200 workers. A central electric power station was built for haulage, pumping and ventilation at the mine. A hospital was opened in 1914, the Union Theatre in 1924 and a baby health centre in 1927. In 1920 a former Welsh coal miner (since the age of 13), Idris Williams, joined the Wonthaggi workforce. He became deeply involved in industrial, cultural and sporting life. By the early 1930s he held office in the miners’ union and had a significant role in a successful union strike in 1934. He helped the town gain the reputation of Red Wonthaggi. Industrial relations deteriorated in the 1930s, reaching a nadir when a mine explosion claimed 13 lives in 1937. Wonthaggi was nevertheless a leading provincial town, Victoria’s sixth largest in 1937. By the 1940s coal mining was in trouble. Under investment in the 1930s and fragmentary coal seams frustrated production. Communist influence in the union overestimated prospects in postwar recovery and embarked on industrial actions. A prolonged national dispute in 1949, led by Idris Williams as general president of the Miners’ Federation, ended in defeat. The years that followed were a ‘gloves off’ anti-Communist campaign by non-Labor governments. Most unexpectedly, fuel oil began to replace coal. By the 1950s the Victorian Railways, the main customers, were changing to diesel and electric power. Mining operations were scaled down and the mine eventually closed in 1968. Twelve shafts had been opened over the years, producing nearly 17 million tonnes of black coal. However, the closure of the mines did not result in the demise of Wonthaggi. In the 1950s, several industries were attracted to Wonthaggi by the available labour force. Textiles, clothing, engineering and building industries provided major employment for the town. Wonthaggi became the regional centre for a wide area. The State technical school (1922) was supplemented by a high school (1969) in nearby Dudley. The establishment of the town allowed the development of surrounding farmland and provided a market for produce. The main farming activities are dairying and grazing. The town also serves a number of coastal townships, largely catering to tourists attracted by the beaches and rugged coastline. In 1997 Cape Paterson was added to Wonthaggi borough, making an area of 48 sq km. In 1994 several shires were amalgamated with Wonthaggi borough to form Bass Coast Shire which is headquartered in Wonthaggi. There is little reminder of the town’s coal mining origins. Part of one mine has been reopened as a tourist attraction, with a mining museum and underground tours, and the mine whistle is sounded daily in the town. A landmark in the town is the Wonthaggi Hotel, the entrance to which is framed by the jawbones of a 74 foot whale which was washed ashore near Wonthaggi in 1923. The northern and eastern precincts of the State coal mine, the railway station (1912) and the courthouse (c1929) are on the Victorian Heritage Register. Wonthaggi has a hospital, two State secondary college campuses, two State primary schools, a Catholic primary school (1911), a TAFE college, several recreation reserves, golf, bowls and swimming venues, an arts activity centre (1982), two caravan parks, a tourist information centre and a comprehensive shopping centre. Survivors of the town’s coal mining past include the Working Mens’ Club (1910) entertainment venue and the Union cinema. The railway line (1909-78) has become a rail trail. In 2013 Victoria’s state planning minister released a planning blueprint that signaled population and employment growth in rural towns including Wonthaggi. In 2007, after several years of drought, the Victorian Government decided to augment metropolitan Melbourne’s water supply by piping water from north of the dividing range and by building a desalination plant on the Gippsland coast. The chosen site is near the mouth of the Powlett River, between Kilcunda and Wonthaggi. The plant opened in 2012 and was immedaitely placed on stand-by mode. The project involves piping up to 150 billion litres of desalinated water (one third of Melbourne’s annual consumption) to the Cardinia reservoir, a distance of 85 km. Desalination is a hungry user of electric power, and an offset wind power generation farm at Glenthompson, western Victoria, was proposed. High saline discharge also harms marine life. The project has met with fierce criticism, plus the paradox of drought-breaking rainfall in 2011 topping up water storages and stopping work at the desalination plant. The plant garners a big annual fee for its owners, whether or not it is used. Five kilometres north-west of Wonthaggi, on the Bass Highway, there is Hicksborough. It had a railway station and a short lived school (1911-14). Hicksborough had census populations of 307 in 1921 and 274 in 1933, but apparently its census was reduced after then. Under 100 were recorded until 1961. The Hicksborough general store on the Bass Highway is a landmark. On Wonthaggi’s western edge there is South Dudley, probably named after Earl Dudley, Governor General of Australia, 1908-11. Its school opened in 1914 as an adjunct to Wonthaggi primary school, and closed in 1954. Its census population in 2011 was 398. Populations are for Wonthaggi borough, 1911-91, which included Cape Paterson. *includes South Dudley and Wonthaggi North.